Block Island historic property in the 'Old Town', initially build around 1850, this property housed the General Store. Completely renovated in 1985 by owner, amenities include hard pine floors and new kitchen and bath. The bedrooms are a queen size bed, a full size bed and a futon sofa bed in living area to sleep 2 more people, plus a private entrance and bath. Amenities include, full kitchen, gas grill, air conditioning, wireless internet and outdoor shower. Lawn chairs set up under 2 maple trees for out door seating. Keywords: This Historic Property(1850's) has been completely renovated and is located about 1 mile from town and beaches. The house has a total of 3 units consisting of 5 bedroom, 3 baths, queen couch, and 2 futon couches (Each unit sleeps 6 max.and studio sleeps an additional 4.) Amenities include hard pine wood floors, tile bath, Dish TV, outdoor shower, air conditioning, appliance kitchen. Can be rented Sunday to Friday (2-5 nights) weekends-Friday-Sunday (2 night minimum) or weekly (7 nights max). Flexibility is the reason to rent this property. This unit can be rented in conjunction with VRBO listing #896316 to add an extra bedroom and bath and 4 more people and or listing #877228 to add 2 more bedrooms, another bath and full kitchen (sleeps 6 more). Can also be rented nightly; midweek, Sunday -Thursday (3 night minimum), weekends (2 minimum, 3 nights on HOLIDAY weekends), or weekly. Linens and towels are included. Please contact owner for availability and rates. Paper towels, toilet paper and bar soap. Arni was a great host, and good communicator, and we had a wonderful time on Block Island. The home has everything needed for a comfortable stay. The place was clean and exactly as described. It’s actually even cuter in person than you can see in the photos. Highly recommended. We had a great stay at Arnies place. The location was perfect for exploring various parts of the Island. The apartment had everything we needed and checkin was a breeze. Getting to Arnie's was easy and no-fuss! The place was tidy and had very comfortable beds. You get the best of both worlds -- the surroundings are peaceful and quiet but it's such a quick ride to town for dinner and drinks. The rooms were just like the pictures. Not far from anywhere. Everything was as stated, no disappointing surprises. Great place. Arnie was very helpful. Will definitely stay there again. Formally a General Store in the mid 1800's, the property is located in 'The Center', formally the 'Old Town' off Center Rd. 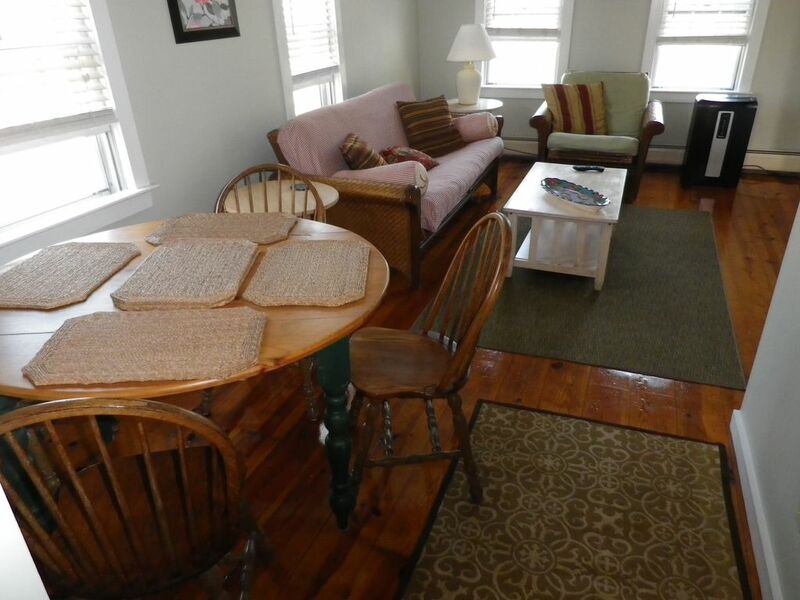 Conviently located, 1 mile from Town and Cresent Beach, 1/2 mile from Great Salt Pond and Marinas and the Oar Restaurant. Cleaning fee of $120/unit for weekly rentals..credit card on file for damages.